Cheritz’s latest mobile dating game is a unique take on the genre with its interactive messaging element. After following mysterious instructions from an unknown source, you find yourself joining a secret party planning association called the R.F.A. But why stop there? If you follow our wig suggestions below, you can immerse yourself even deeper by becoming one of the R.F.A. members themselves! The founder of the RFA, Rika is a charismatic and charitable person who brings people together from all walks of life. You can use our wavy Iris style to achieve Rika’s voluminous locks or, if you would like a little more length, you can trim the bangs of our more curly Hera style. V is a successful professional photographer who is unwaveringly loyal, but bears his burdens alone. 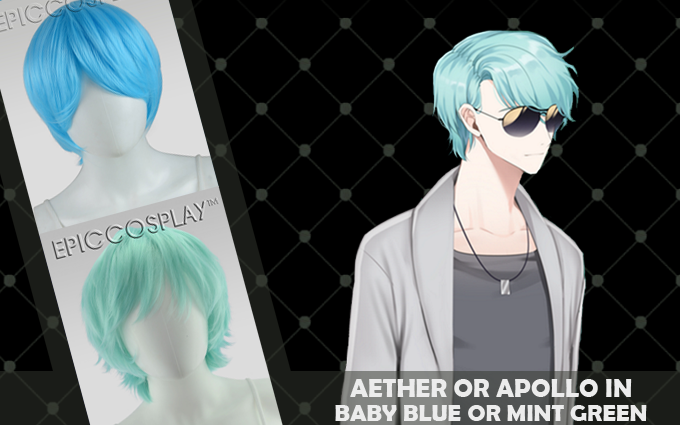 You can pull off his chic look with either our Aether or Apollo wig by heatstyling the bangs to maintain his stylish flip. Sweet and lovable Yoosung is a college student who plays too many videogames for his own good. You’ll want to use heat styling to keep up his winged bangs on either our Apollo or Atlas style. Our Atlas style comes with a natural looking hairline so that you can part it down the middle and show off that cute face, but it’s recommended to trim and layer the bangs to achieve that feathery look. The flirtatious and narcissistic actor known as Zen is an up-and-coming star who wants to make it big. Our Apollo style is perfect as a base wig for this messy devil-may-care look. For his truly impressive ponytail, sew in one of our 45″ weft extensions or, if you’d like a little more length and convenience, our 50″ ponytail wraps will work just as well. The son and heir of a wealthy family, Jumin is a mature business man who loves to talk about his cat. Use heat-styling on either our Aether or Atlas for his sweeping bang style. Our Atlas style comes with a natural looking hairline, but it’s recommended to trim and layer the bangs to achieve that layered look. Code name 707 is an outgoing internet jokester with a passion for pranks and hacking. Our Apollo will work as is, just tousle it to look like you just rolled out of bed after a late night of coding. If you want a little extra bangs, you can also layer our Aether style to achieve the same look. Next PostNext WIGSPIRATION: Love Live! Sunshine! !